With the Nomad in the body shop and the weeks slipping by I was overdue to go and check out what was happening. Brian wanted a few more bits and after a few phone calls we had decided to save some time and money and get two lower door skins to provide a clean slate to work with rather than patch up the rust in the lower doors. It was a similar story with the bonnet. Blind Freddy could see that something had happened to it at some stage and looking at the underside you could see some serious hammer marks right in the middle, which seemed a strange place to take a hit. Maybe something in a previous owner’s garage fell on it but whatever the story it had been skimmed in bog on the topside and painted over. The amount of work involved to get it right and the accompanying cost could be negated by getting a brand new one so we have gone down that route as well. 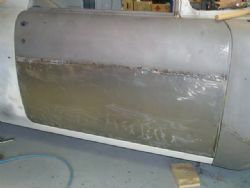 The boys at Joscar have fitted the lower patch panels on the front guards and had completed the driver’s door skin. 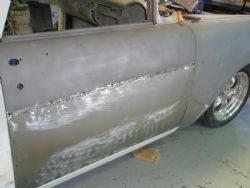 The passenger door had been sliced up and the skin just needed to be welded into place. Things were moving along. 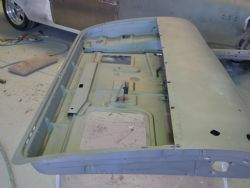 The dash had seen the final touches also and is now in primer after the inserts had been aligned, gapped and fitted along with the gauges and instrument cluster. That all came up looking good and I could start to visualise how it would look painted and complete. Brian and Joe wanted to get the bumpers, front and back, from me to align those as well and if need be massage the brackets so they all lined up accordingly. Rear tail lights, top of the outside door trim, hood rockets and hood bar and extensions completed the list of requirements for alignment before the body is parted from the chassis. When they saw the bumpers they asked what I was expecting to do with them. Being from California the Nomad came with a one piece front bumper which happens to be huge, long and heavy. Joe picked it up and told me I was dreaming if I thought about getting it re chromed as most places couldn’t handle the length and it would cost a bomb to do. After a ring around I found out he was right. 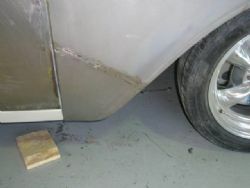 The rear bumper, which breaks down into three pieces was quoted at roughly fifteen hundred dollars on the basis it was in good nick and didn’t require too much work....nobody wanted to or had a tank big enough to touch the front bumper.